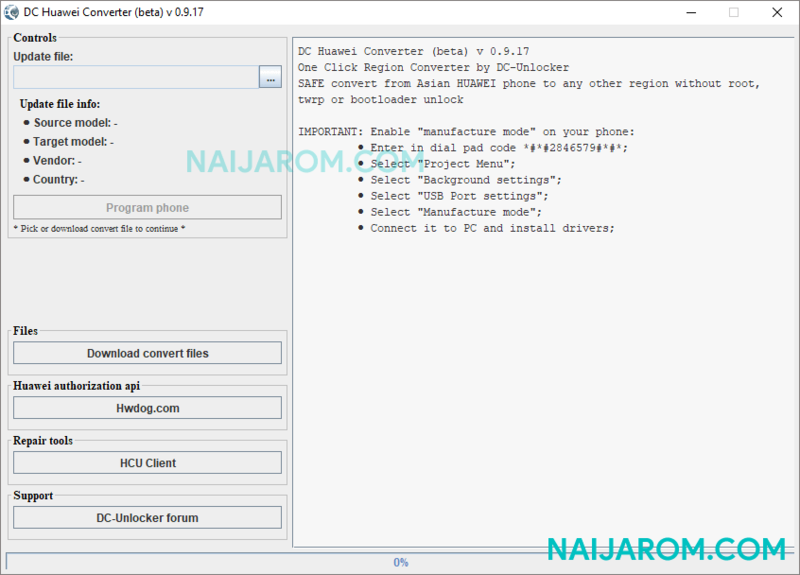 DC Phone Converter v0.9.17 is a small application for windows computer which allows you to convert your Huawei device to any other region without having the root access, installing twrp recovery or unlocking the bootloader. In order to use the DC Phone Converter Tool properly, you need to install the Universal ADB Driver on your Computer. Once Driver is installed, Enable Manufacture mode on your Huawei Smartphone or Tablet by dialing *#*#2845679#*#8. Then select the Project menu on your Huaawei device > Then Select background settings > USB port Settings > Select Manufacture Mode. Now, connect your Huawei device to the computer and launch the DC Huawei converter Tool on the computer. Once Tool is launched, Click on the Download Convert files for your device and using the Update File Browse button select the convert file and click on the program Phone to begin the converting process. [*] Credits: DC Phone Converter v0.9.17 is created and distributed by DC Unlocker Team (developer). So, full credits goes to DC Unlocker Team (developer) for sharing the tool for free.